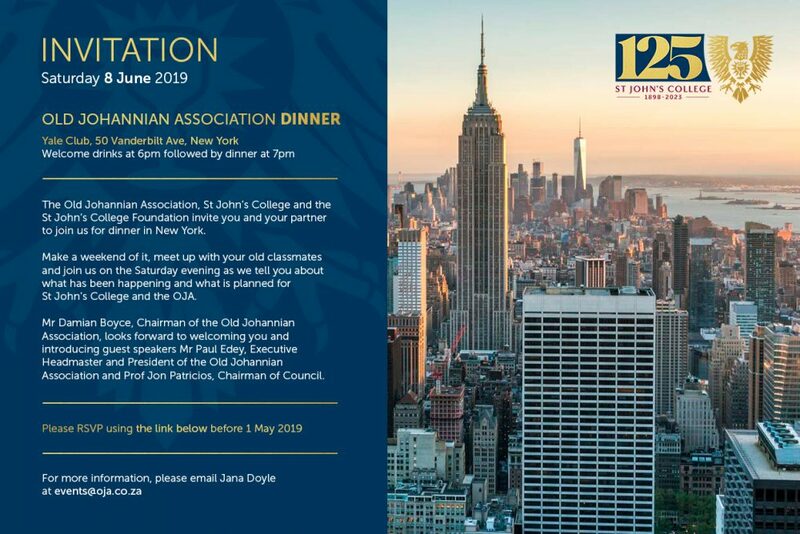 The Old Johannian Association, St John’s College and the St John’s College Foundation cordially invite you and your partner to join us for dinner as our guests at the Yale Club in New Your City on Saturday, 8 June 2019. The evening will be hosted by Mr Damian Boyce, Chairman of the Old Johannian Association. Guest speakers Mr Paul Edey, Executive Headmaster and Prof Jon Patricios, Chairman of Council, will reflect on the past 120 years of St John’s College and share the school leadership’s strategy and five-year plan to maintain our standing as a world-class Christian, African school. Why not make a weekend of it in New York City? Catch up with your fellow alumni and learn about what has been happening at your school and the vision for the future as we move towards our 125th anniversary in 2023. The Yale Club is located at 50 Vanderbilt Avenue on the corner of 44th Street, across from the western entrance to Grand Central Terminal. There are many hotels in the area, and it is within walking distance of the theatre district and Times Square. Please do not hesitate to contact us if you would like suggestions for hotels or have questions about your weekend in New York. Dinner reservations will be confirmed via email and honoured on a first-come-first-serve basis. We look forward to you joining us on the 8th of June. Click here to RSVP before 1 May 2019.